We Make It Simple. Search Below. If you're looking for a trusted used car dealership that specializes in helping people with all types of credit, then Rocky's Auto Credit is the place for you. We have locations in Mesa, AZ and Glendale, AZ - but we also serve customers throughout Tempe, Chandler, and the greater Phoenix area. We're truly the smart choice as your next used car dealership in Arizona. Our car loan application process is quick, free and completely secure with no obligation. Rocky's Auto Credit can get you approved for car financing no matter what your credit score is. If you have good credit, bad credit, no credit, or even bankruptcies; we can help. 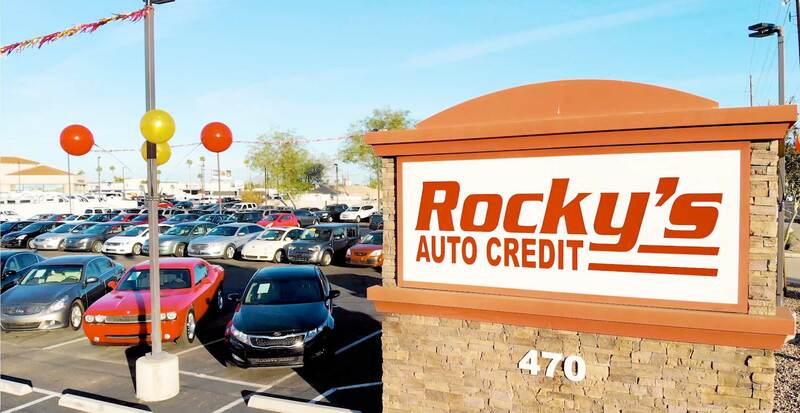 , Rocky's Auto Credit in Mesa, AZ and Rocky's Auto Credit in Glendale, AZ are both staffed with trusted experts that are experienced in helping people attain car loans with all credit types. Traditional used car dealerships just don't have the ability to work with as many lenders as we can. Our team of financing experts know exactly how to pair the right vehicle with your budget and financial situation. If you have gone through a bad credit problem or have had difficulty acquiring an auto loan in the past, then we're the people you need to talk to today. Get started on building your credit score and driving a reliable and affordable car today! Rocky's Auto Credit will help you with all of your auto finance and vehicle needs. Buy Here Pay Here auto financing is the easiest and most popular way to buy used cars and rebuild your credit. At Rocky's Auto Credit, we have two convenient locations in Mesa, AZ and Glendale, AZ. Our car dealerships also proudly serve Tempe, Chandler, and Phoenix. With as little as $299* down payment and low monthly or semi-monthly payments, we can get anyone approved! No matter what your credit situation, our specialists can help tailor a finance package to fit your needs. Our specialists experience with a wide variety of banks, credit unions and military financial partners helps us provide financing for all credit levels. We are sure we have a vehicle and financing to fit your need’s and your budget. We have 100’s of used cars at our dealerships in Mesa and Glendale to choose from, so give us a call, stop by, or apply for financing today. What Do You Need to Get Approved for an Auto Loan? Piece of Mail with current address. Arizona State I.D. or Drivers License. Free 15-day / 500-mile limited warranty. We do all the title work for you and get your license plates! We do all emissions testing up front so there's no risk to you. Super low rates (o.a.c), low down payments, and low monthly payments (o.a.c) are what people rave about when they shop with us, but our inventory is top-notch, too! We offer low-mileage, late-model used cars and used trucks with low pricing - so why buy from the big dealers when you can get low pricing, low mileage late model cars and trucks at Rocky’s Auto Credit? You shouldn't! If you’re looking for an inexpensive vehicle to purchase we offer value-price used cars between $1,995 - $6,995. If you're interested in a value-priced used car, these cars are the perfect way to get a great value car or truck with a no haggle price to fit your needs. for a used car loan today! Please feel free to reach us for any questions or concerns.